This is a custom cottage built entirely of redwood (he was in the lumber business) by my grandfather in 1926 and has been in our family for four generations. It sits on two+ acre lot right on the water and has been entirely modernized with all the amenities of a year-round home. Brand new kitchen remodel - new cabinets, granite countertops, lighting, etc. Appliances, beds and much of the furniture has all been replaced and upgraded in the last two years. Newly renovated bathrooms. New carpeting and windows throughout the house. Beautiful porch with wicker furniture and Adirondack chairs overlooking the bay. New gas fireplace insert in large stone fireplace for chilly mornings. Great flat rock shore for swimming - especially for younger swimmers. Wonderful biking, running, walking, swimming, and communing with nature in rural setting. Our family welcomes you to our home... When my parents passed away, I purchased the cottage from my siblings and have vacationed here with our family ever since. This is not a real estate investment, it's our family home. We rent to friends and those we are certain will treat it with respect - and leave it in the same condition as they found it. My grandfather built this cottage in 1926 and it has been in my family ever since. Located on 2 acres right on the water, beautiful private shoreline perfect for swimming (for young children as well), 25 acres of fields in back of the house to explore, great area for fishing, sailing, bike riding, walking, bird watching, exploring and just relaxing. Best sunsets in Northern New York! Beautiful flat rock shorefront that tapers gently into the water - making this ideal for young swimmers. Just a walk down the driveway and across the very quiet road, you meet the shoreline of this beautiful Lake Ontario rental. We've rented for years, and are never disappointed. Andy takes great care with his summer home and is a delight to rent from. He has managed some nice improvements, making cooking super nice in his well equipped kitchen and on his new gas grill. Comfort, large space for entertaining, and most of all, a great shoreline for lots of games and great clean swimming. Great for small children as it's shallow for a number of yards and generally very calm. The Hamlin cottage made a perfect home base for our week in the Thousand Islands region. The house was comfortable, with a location that offered easy access to surrounding towns; the front porch and back yard offered additional spots for eating and relaxing; and the water directly across the street was calm and refreshing. Andy was lovely to work with as well. Thanks, Andy! Thanks for your very nice review! Charming cottage with all of the comforts of home! This is a fantastic cottage. Brand new kitchen, large living room and dining, 3 bedrooms and 2 full baths. There is cable and WIFI. The shoreline is on Chaumont Bay and is just beautiful. There is a backyard patio with a gas grill and lots of furniture. Huge lot with lots of room for kids to play. My favorite spot is the front porch for sipping coffe in the morning and listening to the lake. It is close to town...several great restaurants and a small grocery store in town. The owner is very helpful and accommodating. Linens are provided and it is very clean. All you need is food and drinks. We just love this beautiful cottage! It is truly my happy place. We have rented every summer since 2016 and we will be returning this summer as well. Beautiful lakefront property, big enough to accommodate family gatherings! We have rented this property several times over the years and are always so happy! Andrew is a very attentive and gracious host, and it’s clear that this property is important to him and his family. It’s immaculate. Plenty of kitchen space and equipment for me to entertain family. Amazing and shallow shoreline that allowed me to relax with my babies and still provides entertainment now that my children are 10 and 8. Stunning sunsets, great walks, great swimming and shoreline sunning, as well as fishing and kayaking. Truly a slice of heaven! 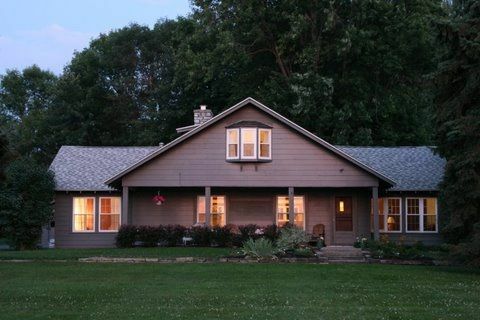 The Hamlin House is a lovely home in as peaceful a setting as you will find. My family and I have vacationed here for 24 years. We quickly feel at home on Point Salubrious, love the beauty of Lake Ontario and the house’s proximity to the 1000 Islands and Canada. We love to sit on the porch in the evening with family and friends and watch the sun go down. The house, yard and waterfront are large enough to accommodate any and all guests. For us, it’s perfect!